Choosing the right bathroom vanity can really set your bathroom apart from all others. While your bathroom is generally the smallest area of the house, you want it to be the most luxurious room in the home. Your guests will really have some to talk about if it is clean, bright and calming. Some think the kitchen is the most important room in the house and while most of the time it is, the bathroom is second to that. Therefore, when remodeling your bathroom make sure that you pay attention to the design and color of your space. Make sure to use light colors or even wallpaper designs. Guest bathrooms are much smaller and lighter colored walls, vanities and décor can create a larger more open look. Using lighter colors can really change a person’s mood. Did you know that the use of darker colors can create a negative space and make a smaller room feel like the walls are closing in? 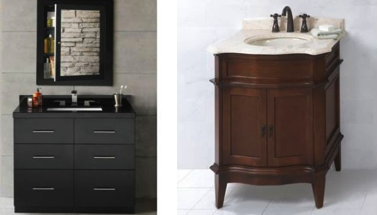 Therefore, when choosing a bathroom vanity, you want to choose one that exudes positivity and relaxation. Don’t feel like darker vanities are not usable in smaller bathrooms. You can use darker vanity colors if you have complimenting colors in the bathroom for walls and décor. 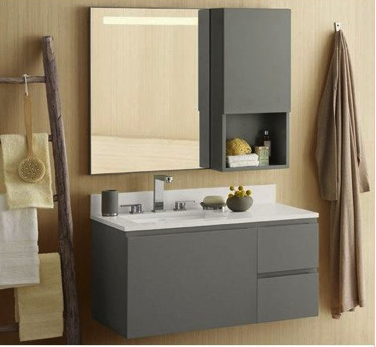 Such as Ronbow – Lassen 36 Inch Eco-Friendly Bathroom Vanity Cabinet carried at Plumbtile. This vanity is s beautiful sleek design that is perfect for a smaller bathroom with lighter colored walls. Something you must consider when choosing your bathroom vanity is your space and size. Make sure that you choose the vanity that will work perfectly for the space you already have. Most people are not knocking down walls and expanding their guest bathrooms. Try and plan the bathroom vanity around the size of your bathroom. If you have a spacious bathroom you can choose a larger vanity. 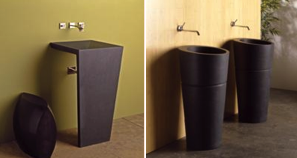 Pedestal vanities can be a great option for those extra small spaces. While they do not have a large storage area you can create a functional space without making the space feel claustrophobic.